Product prices and availability are accurate as of 2019-04-17 13:34:04 BST and are subject to change. Any price and availability information displayed on http://www.amazon.com/ at the time of purchase will apply to the purchase of this product. Doctor of Natural Medicine, Nutritionist, Clinical Herbalist and PhD in Natural Health Sciences, Dr Cobi Slater explains how to easily transition into gluten and dairy free eating. As a mother of two young sons with Celiac disease and a husband who is gluten sensitive, Dr Cobi not only has helped thousands of patients achieve optimal health but she also lives a life where hypoallergenic eating is a must! The Ultimate Gluten and Dairy Free Cookbook provides crucial information on how to eat a gluten and dairy free diet with ease. Included are hundreds of delicious and easy-to-make recipes for the whole family, a gluten and dairy free pantry list, how to navigate your way through gluten free flours as well as a detailed list of foods to avoid. If you are struggling with health issues or you simply want to eat a healthier diet, then this cookbook will be an excellent guide to help you and your family along the way to living a lifestyle of exceptional health. 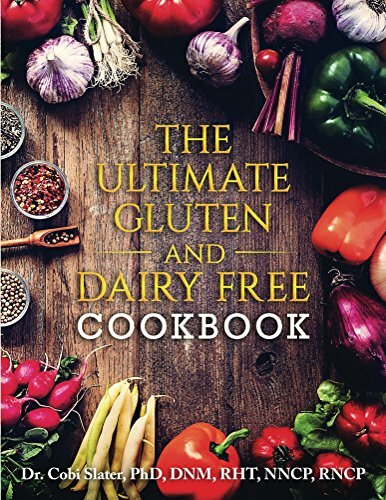 Whether you are looking for a quick breakfast idea, a favourite entrée, a slow cooked soup or many more delicious recipes, The Ultimate Gluten and Dairy Free Cookbook will show you that gluten and dairy free cooking can mean healthy, easy and nutritious eating for everyone! Dr Cobi Slater is a Board Certified Doctor of Natural Medicine, Registered Herbal Therapist, Registered Nutritionist and she also holds a PhD in Natural Health Sciences. Dr. Cobi is the founder of Essential Health Natural Wellness Clinic located in Maple Ridge, British Columbia, Canada. Dr Cobi is extremely passionate about helping others heal naturally as well as empowering patients to live a life of optimal health. Dr Cobi is a regular guest on many international radio and TV health shows. She also contributes to numerous publications as a health expert and is the author of 3 health books including The Ultimate Candida Guide and Cookbook, The Ultimate Hormone Balancing Guidebook as well as The Ultimate Metabolic Plan. Dr Cobi has helped thousands of patients regain their health through lifestyle changes resulting in a freedom to enjoy life like never before! Dr Cobi grew up in an environment with her mother ceaselessly searching for various natural remedies to heal herself from a life-threatening illness. As a witness to her mother’s dedication to nurture herself back to health through the use of natural medicine therapies which did not have the many side effects of chemical drugs, Dr. Cobi recognized that one's health is not exclusive to the physical body. It became obvious that optimal health and wellbeing stem from an intimate connection between the body, mind and spirit. Dr Cobi‘s inspiration to pursue a holistic approach to health and wellbeing led her to establish Essential Health Natural Wellness Clinic. Dr Cobi is dedicated to providing professional, safe and effective complementary healthcare through the use of research and evidence-based natural medicine therapies. Offering assistance for chronic disease, hormone issues, immune health, allergies, skin problems, digestive complaints, nutrition counseling and lifestyle counseling to name a few, Dr Cobi educates and empowers individuals to achieve an optimal state of health and wellbeing.